The business office of tomorrow is here today in Naples thanks to the vision of FGCU alum Brett Diamond, (’12, Business Management). The same year Diamond graduated, he ventured into a revolutionary concept for collaboration with his dad, David, a serial entrepreneur best known as co-founder of DeAngelis Diamond Construction, a leading national commercial builder. The Diamonds’ rough theory: the “co-work” space – a concept favored by many tech startups to minimize operating costs – would also work for a broader base of business models. So five years ago, the Diamonds introduced Venture X, a shared-workspace environment designed to encourage free collaboration and communication. 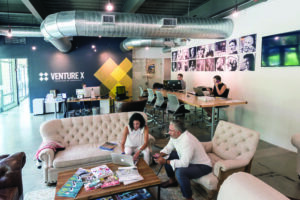 With the flagship office in the Mercato development in Naples, Venture X is billed as part boutique hotel and part modern office space, where a diverse community of architects, publishers, tech startups, attorneys, real-estate brokers, small businesses and other professionals choose among a variety of membership options – all designed to foster communal work habits and networking. Mary Rodriguez (front left) and Luis Gonzalez of Off Market Miami, a company that helps investors acquire distressed properties, collaborate at the Venture X office in Naples along with (back from left) Jana Greer, Venture X community coordinator; Jason Heartgrave of Futurepreneur; and Martha Diveley of Arivs Appraisal Management. The younger Diamond, who also carries the title of chief innovation officer at DeAngelis Diamond, is a glittering example of FGCU helping to inspire a young mind that grows and goes on to inspire others. The venture is clearly a success. The Diamonds have commissioned Venture X locations in San Antonio, Texas; and Ontario, Canada, with five franchises planned in Texas, two in Florida (Miami and Sarasota), two in Colorado, another in Maryland and plans for a satellite location in Australia. When X marks the spot Down Under, it’ll truly be a small business world after all.